I was going to be big about this. 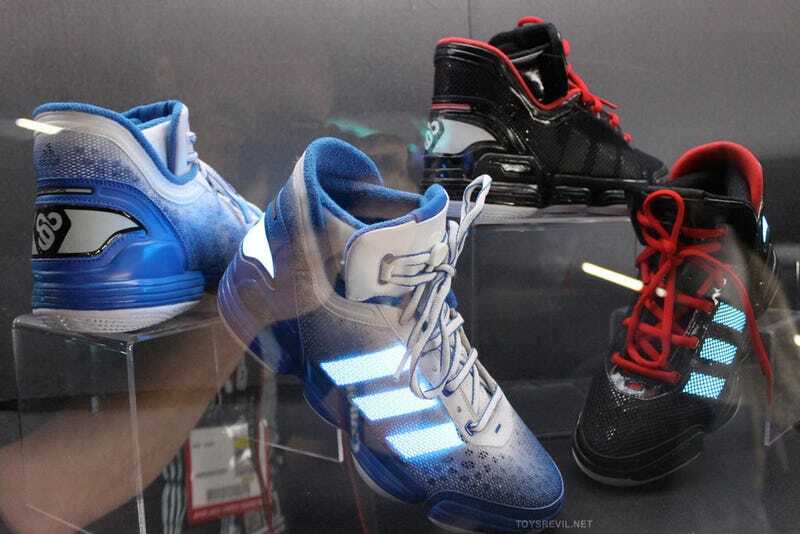 I was going to just make a pithy one-liner about these TRON shoes by Adidas, due out in December. But then I felt an itching under my skin...it was...the geek inside. That geek has three-point thesis on why these TRON shoes make him want to make jokes about strapping Looney Toons dynamite onto his chest* and walking into Adidas central, but the current social climate would only lead to a serious terrorist investigation on the matter. Once the geek was finished geeking out, Mark Wilson—that's me, a completely harmless individual, DHS! !—would wake in some sort of underground CIA lab, naked, not because the green geek's muscles had torn his clothing from his soft frame, but because losing everything had somehow made him comfortable enough with his body to show it to surely-fit interrogators. Adidas skimped out on LEDs, instead opting for glow-in-the-dark stitching and "reflective" screen prints. In other words, if you're standing closely enough to an actual glowing guy from TRON, your shoes MAY sorta look like they're glowing as well. UPDATE: OK, I'm blaming under-explained marketing materials, but I was totally wrong about this point. They do glow, using something called ELastolite, the same stuff used in the movie costumes. This material, indeed, sounds pretty incredible. Maybe they're snowflakes. Maybe they're puppy paw prints. I don't know what they are; I just know what they're not: TRON. There are no flowers in TRON. Did Adidas even see the movie? Did Adidas even see the trailer? Did Adidas even see a reasonable color palette? * The real Mark Wilson earnestly questioned the consequences of making this joke, so he added the Looney Toons bit and the reference the the joke itself within the joke to quell the authorities. Don't think of it as personal censorship—that's dually upsetting and pitiful. Think of it as comedic inception. ** The real Mark Wilson may own and adore a pair of high tops purchased within the last year. He's also fairly certain that, while all his friends made the timely transition from high tops to skater shoes back in the day, he was somewhere between several months and years late on that one.